Me contactó Stella Zuccarelli. Ella es descendiente de los Stephens que vinieron en el SS Dresden. Su bisabuela fue Mary Anne Stephens, hija de Robert y Rose. Mary Anne tenía 2 años cuando llegó a Buenos Aires en Febrero de 1889. Stella me comenta que su padre solía contarle cómo era la vida por parte de su mamá y su familia irlandesa. Nunca le contaron el por qué habían venido para Argentina, pero sí que habían parte de la familia que se había quedado en Irlanda. Los Stephens que vinieron en el barco fueron Robert (31) y Rose (23), los padres y John (14), Mary Anne (2) y Margaret (3 meses), los hijos. Junto a la familia vino la madrina de la pequeña Mary Anne, Mary Bennett (24) (figura en el Certificado de Bautismo). Stella se decidió por investigar a su familia una vez que su padre falleció. Ella se encontró con la partida de nacimiento de su bisabuela Mary Anne junto con un puñado de historias que recordaba y fotos viejas de la familia. Cuenta Stella "respecto a Mary Anne creo que el recuerdo de ella me trajo hasta aquí. Siempre se dedicó a la costura en casonas de Hurlinghan. Los Stephens eran de familia humilde. Solo su madrina Bennett adquirió otro estándar de vida. Siempre contaban de una artista hermana de ella en Irlanda. Esto es toda la información que tengo". Stella está tratando de encontrar familiares tanto en Buenos Aires como en Irlanda que le puedan contar más qué fue de su familia y además sobre Mary Bennett. Y finalmente agrega que "No quiero la ciudadanía ni nada por el estilo. Solo quiero saber de donde vienen mis raíces. De Italia solo tengo el apellido y el nombre. Pero las costumbres no se pueden evitar." Stella Zuccarelli has contacted me. She is descendant from the Stephens who came on board the SS Dresden. Her great-grandmother was Mary Anne Stephens, daughter of Robert and Rose. Mary Anne was 2 years old when she arrived to Buenos Aires in February 1889. Stella told me that her father used to tell her how was his mother’s life about and of the rest of the Irish family. Nobody ever told her why the Stephens came to Argentina, but what they did to tell her was that some relatives had remained in Ireland. The Stephens who came on the ship were Robert (31) and Rose (23), the parents, and John (14), Mary Anne (2) and Margaret (3 months), the children. 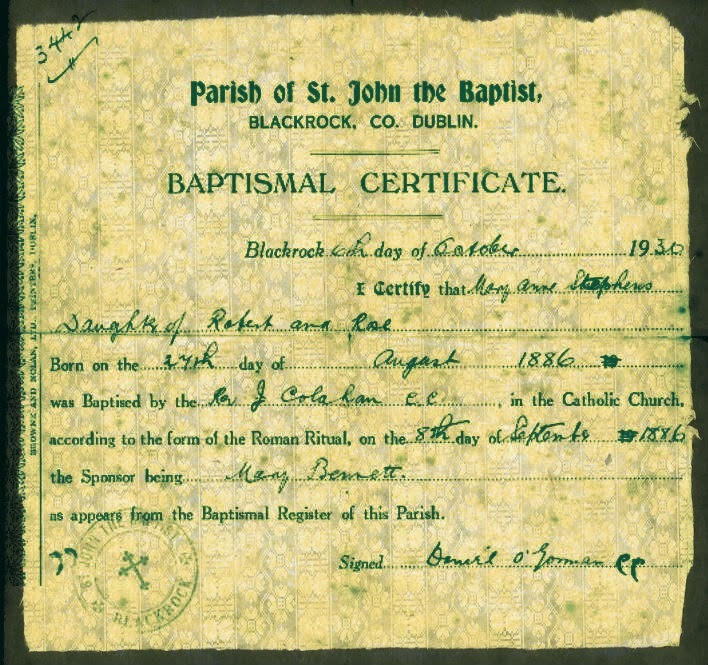 Along with them, it came the Mary Anne's godmother, Mary Bennett (24) (contained in the Baptism certificate). Stella decided to investigate his family after his father died. 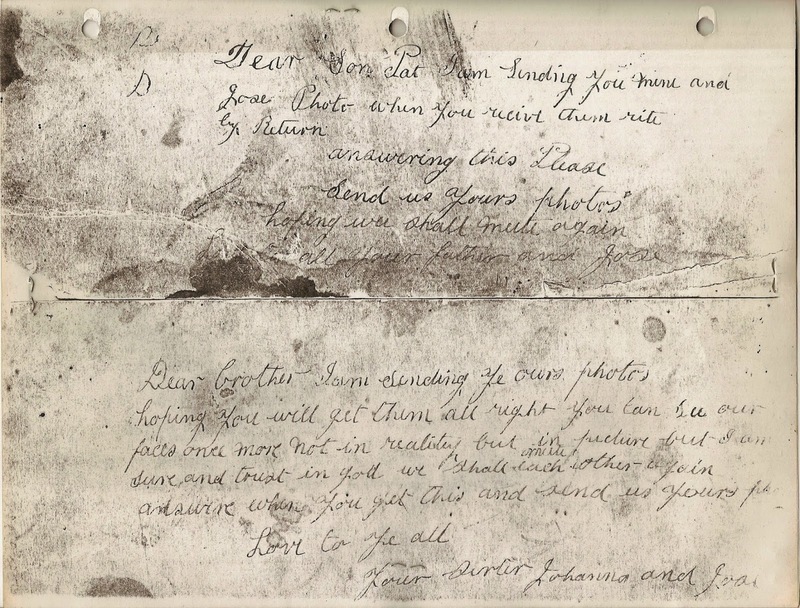 She found the baptismal certificate of her great-grandmother, Mary Anne, along with a handful of stories that she remember and some old family pictures. Stella says "about Mary Anne I think that her remembrance brought me up to here. She was devoted to sewing in Hurlingham’s mansions. The Stephens were a humble family. Only her Godmother, Mary Bennett, got another standard of living. It was always said that Mary Bennett had an artist sister in Ireland. This is all the information I have." Stella is trying to find relatives both in Buenos Aires and in Ireland that could tell her more about what was about her family and also about Mary Bennett’s life. She finally adds that "I do not want the citizenship or anything like that I just want to know about my roots. From Italy I have only my name and surname. But habits ones cannot avoid." "Further to your letter on the Limerick Leader last week concerning the emigrants who embarked on the SS Dresden in Cobh for Buenos Aires in 1889. I am the Grandaughter of Louis Bourke who was one of them. I was told his wife died and that he took all his children with him. Then a relative told me that his wife went with him. This I’m not sure of. A friend of mine looked it up on a computer and he got the names of the people that went.They arrived on the 15/2/1889. 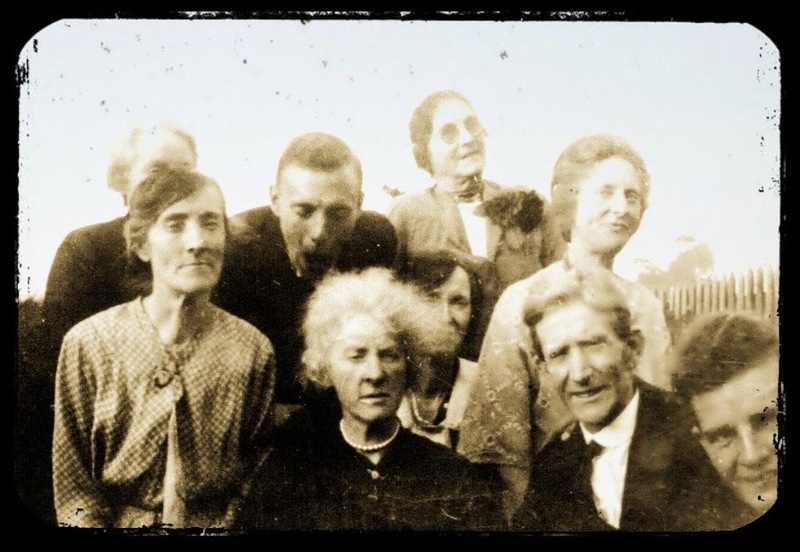 Louis Bourke (Father), Ellen, John, Mary, Patrick, Kate, Margaret and James. Louis (The Father) came home and brought his son John with him. Louis re-married and my Father (Tom) was his son. 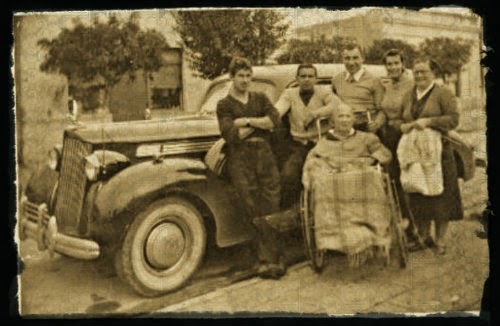 The rest of the family stayed in Buenos Aires. I dont know anything about them. There must be a few of their off-spring still there. My father is dead since 1977. He often spoke of his step family in South America. My father was born in 1901, so my Grand Father came back at least a year or two before that. My father used to tell me that his father was working in some ranch looking after horses and cattle while he was in Argentina." "En respuesta a su carta en el Limerick Leader la semana pasada en relación con los emigrantes que se embarcaron en el SS Dresden en Cobh hacia Buenos Aires en 1889. Soy la nieta de Louis Bourke, quien fue uno de ellos. Me dijeron que su esposa murió y que se llevó a todos sus hijos con él. Luego, un pariente me dijo que su esposa se fue con él. De esto no estoy muy segura. Un amigo mío buscó en la computadora y encontró los nombres de las personas que fueron. 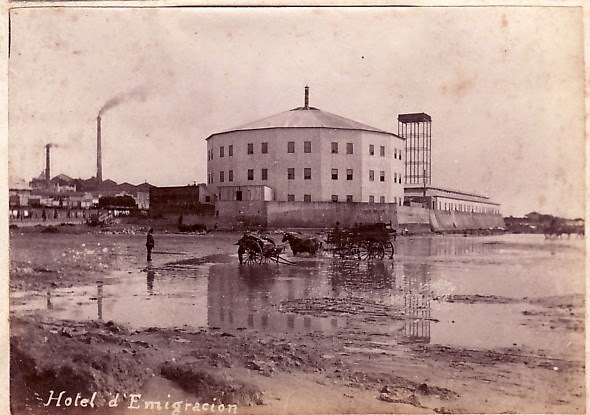 Llegaron el 15/2/1889. Louis Bourke (padre), Ellen, John, Mary, Patrick, Kate, Margaret y James. Louis (el padre) se volvió y trajo con él a su hijo John . Se volvió a casar y mi padre (Tom) fue su hijo. El resto de la familia se quedó en Buenos Aires. No sé nada de ellos. Debe haber unos pocos descendientes aún por allá. Mi padre murió en 1977. A menudo hablaba de su familia en América del Sur. Mi padre nació en 1901, por lo que mi abuelo regresó al menos uno o dos años antes de esa fecha. Mi padre solía decirme que su padre había trabajado en algún rancho cuidando de los caballos y el ganado, cuando estuvo en Argentina." Following, the letter of Mr. Michael Byrne to The Southern Cross, telling some of his impressions his visit to the Hotel de Inmigrantes at the moment when the Irish and English from the SS Dresden where there. Buenos Aires, February 18th, 1889. In company with a friend, I visited the “Asilo” on Sunday morning and a more appalling sight I never before saw. I hope I shall never again behold such wretchedness. Long before I reached the Home, I was stopped by groups of half-starved creatures, whose blanched faces told the hardships the poor people were forced to endure. My friend proposed to take the women and children to a “café”, where they all got tea, bread and butter, he paying the bill. On leaving that group pretty satisfied with the “God-sent” breakfast, we crossed to the station , where we met group after group of starving people, who all complained of hunger. After saying a few encouraging words to the poor people, we passed into the Home, where after pushing our way through a motley crowd of Italians, we came in contact with the Irish. The sight I shall never forget. Never, in this world shall that wretched scene of human misery fade from my mind. Numbers of half-starved men, women, and sickly children lay about in all directions, all crying loudly for something to eat, something to satisfy the intense pangs of maddening hunger. Owing to the great number of Italian immigrants who were located in the Home, prior to the women and children were lowed the miserable satisfaction of passing the night in the dining-room, the dirt of which would be hard to describe. However, it was better than those who had to remain under the inclemency of the skies, without a single thing to cover them or a dry place to lie upon. Quite a number of women remained walking about all night, their husbands refusing to let them go into the dirty dining-room, which, they told me, was infested with vermin of all descriptions. On approaching one respectable looking old man with a sickly child in his arms he said: “Musha, Sor, could we get a sup of milk anywhere? Shure, it is not for myself I ax it, but for this poor child that is dying in my arms. Katie, the “creature”, God help her, is sick also, and poor Mary”, he added, pointing to his wife, who sat nursing another ragged child, “is lost entirely with two c ilder”. And with a look full of tenderness on the emaciated form of his wife, he went on “sure, if anything happened her, we were all lost complately”. Such scenes were witnessed by all who visited the Immigrant’s Home, therefore it is useless to describe them. On moving a little farther I met Mr. John Drysdale went to the cookhouse and ordered that the breakfast be given at once. 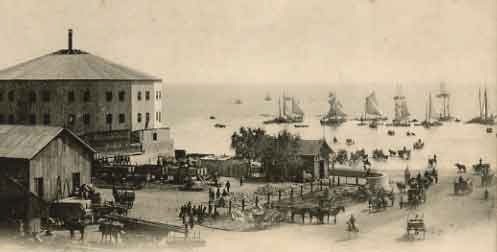 About 10 a.m. on Sunday morning the poor people got bread and meat for the first time that they had anything, since they left the steamship Dresden. 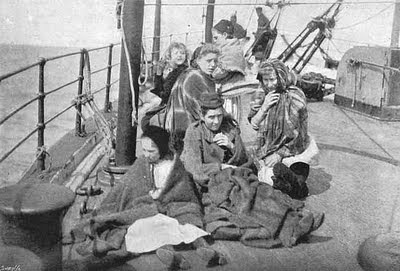 A number of Irish and English ladies and gentlemen put in an appearance, and after a while a good number of the immigrants were taken away. Amongst others I noticed the following who did what they could to alleviate the sufferings of the unfortunate people; Mr. John Drysdale, Mr. E. Casey, Mr. Thomas Duggan, Mr. Michael Dinneen, Mr. J. F. Gahan, Mr. T. A. Gahan , Navarro; Mr. T. Gahan, Suipacha; Mr. W. Ham, Mr. and Mrs. John Cunningham, Father Constantine, Father Gaughren, and Father Adrian, Mr. N. C. Fitzgerald, Mr. James Ham, Mrs. Quiroga, Miss McGuire, Mr. J. Finnigan, and many others too numerous to mention. Before evening many young girls were removed and the women and children began to stir about giving vent to their disappointed hopes, and repeating the false promises held out to them by the immigrant agents in Ireland. Oh! Mr. Editor, could these worthies behold their unfortunate dupes reeking in misery and want, it would prevent them sending another consignment of our countrymen to endure the perils of a wild goose chase to South America. I don’t for a moment question these distinguished gentlemen’s right to earn good living, but I think, Sir, that they ought to earn it honestly. Fancy immigrants being told that when they arrived here, houses would be ready for them, lands given them, implements, seed, money, etc., etc; that Father Fahy was still living, and had a bank for supplying money to immigrants . Such gross falsehood may do for a time but must finally fall through. It is the duty of this present batch of immigrants to write home a true account of their hardship to their people, and not till them, will they prevent their countrymen from being so easily duped. I'am a Dresden descendant, via my grandfather, John Treacy, whose parents met in Argentina after taking the journey with THEIR parents. Now, I have something special to share. 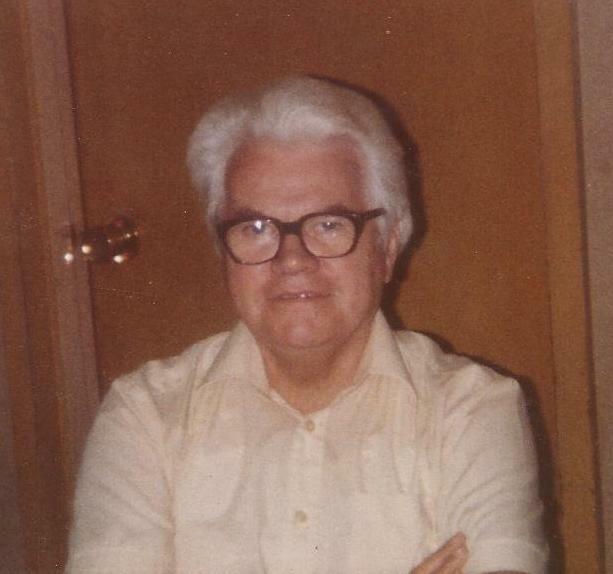 I'm attaching a photo of my Great-uncle, Gerald Treacy, taken sometime in the 1980s. Gerald was born in 1918 and he will be 94 in May 2009. 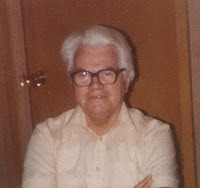 He is my grandfather's brother, the last of 22 cousins born to Patrick & his wife, Kate & Johanna Treacy & her husband, Jose Peña (from Spain or the Canary Islands). Gerald is in a senior residence in Washington state, but he still looks the same, only older. As far as he knows, his paternal grandfather never left Argentina and died there. 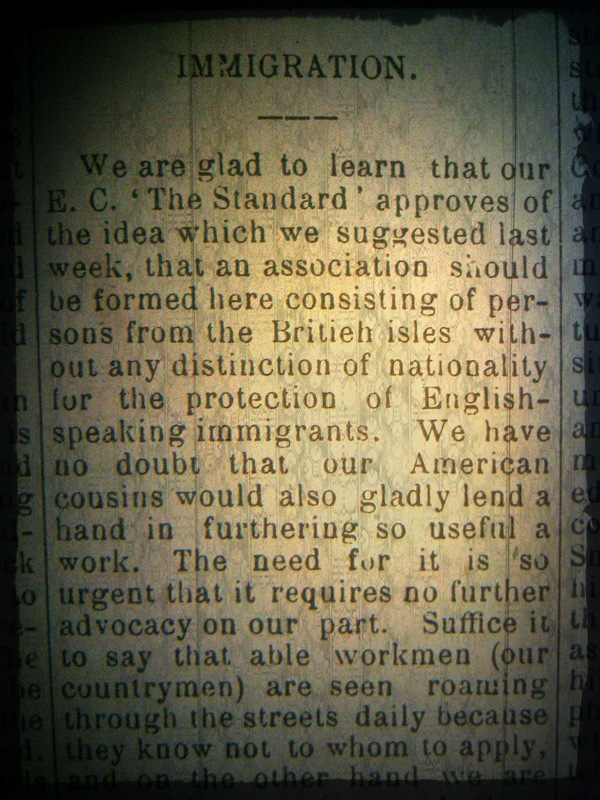 Patrick came to the USA in 1903, 6 weeks after my grandfather was born in Ireland. (His older sister was born in Argentina). Johanna & Jose came to the USA in March, 1912...almost 100 yrs. ago! Patrick Treacy's Wedding record: Feb. 8, 1901. His profession is listed as "mecanico" (maquinista). Married by Father Jules, Passionist, at Holy Cross Church, Buenos Aires. It also says," Domiciliado en la calle Balcane 1214 or 7" -I can't make out which it is, 4 or 7. His bride's address is the same. However, according to family legend, they were married 3 times---once in a Spanish civil ceremony, once in Church & once in English. His wife's name is given as Kate Walshe/Walsh Broughlett. The sponsors were M. Carmody & Elisa Cleary. Patrick married Kate, another Dresden passenger. On the passenger list, her family are numbered 1221, 1222, 1223 & 1224. The family name is Walsh: Patrick, Catherine(nee Mills), son Patrick, & daughter Catherine/Kate. The Walshes were from Tullamore, in County Offaly. The Traceys/Treacys were from Pallasgrean in Co. Limerick. Their first child, Kathleen, was born in Dec. 1901, in Buenos Aires. At some point, they decided to come to the US. Since it was easier to get here from Ireland, they went back there & my grandfather was born there in Sept., 1903. They came to the US six weeks later & the rest of their 12 children were born here, the last in 1924, when my great-grandmother was 48(!). Their daughter, Kathleen, was born Dec. 4, 1901 at Calle Alavarez Nuñez esq. Presidente, Buenos Aires. 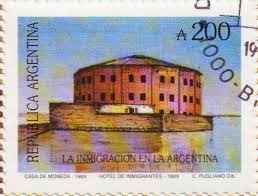 They left Argentina on May 16, 1903, for Ireland. 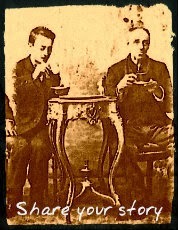 My grandfather was born there on Sept. 12, 1903 & they arrived at Ellis Island/NYC on Oct. 22, 1903. My great-uncle Gerald, their son, b.1918, recorded that his father's brother, Thomas Treacy, died in Argentina in the 1930s. Patrick died in 1940 in Roselle Park, NJ & Gerald remembers how upset his father was when the letter came. His sister, Johanna, her husband, Jose Peña & their children Rosa, Juan, Maria & Patricio came from Buenos Aires on the Voltaire on March 7, 1912. Johanna is listed as Juana de Treacy Pena. She & Jose are listed as being 31 & 32, respectively, but again the ages are fuzzy. Their children were 3, 11, 9 & 7, respectively. Patrick Treacy records that he & his family moved to Camden Street in Roselle Park from Elizabeth on March 27, 1912, so the arrival of the Peñas may have had something to do w/ the move. Kate Treacy, b. 1871(I think--haven't found this record yet) married Edward/Edmund Murphy in Argentina. This Ed Murphy worked on a ranch in Argentina. They had 2 daughters. Nora Murphy was born in Buenos Aires & later married a Charlie Perkins & had a son Billy Perkins. They ended up back in Ireland. They also had a daughter Margaret, who married a man named Leahy. Their son, Eamonn Leahy, who corresponded w/ my uncle Gerald, says that Ed. & Kate went back to Ireland & lived first in a tenement in Limerick city, then moved to a small house on Roseboro Rd. in Tipperary town on the Limerick road. They were very poor. According to Eamonn, most of them died young (30s-50s), so he knew little about them. I hope this is helpful in pinning down the Treacy connection for you! We are also some kind of cousin to Sean Treacy, of the 3rd Tipperary Brigade of the Irish Republican Army. Sean is discussed in a book called "Limerick's Fighting Story." He was killed in a shoot-out w/ the British in Dublin in 1921 or 1922. He was only about 23-24. The Irish list him as a brave patriot, but the British police website calls him a "terrorist". There is a statue of him in Tipperary. A football club is named after him. Gerald Treacy and Granddaughter Patricia, New Jersey, USA. 24 de Junio de 2012: Hola, otra vez! I am so happy to hear from you! Yes, print the picture, by all means. I have been trying to let you know that my dear great-uncle, Gerald, se murio el 28 de marzo 2012. He was the last of the 22 children produced by Patrick & Kate Walsh treacy (12) & Jose & Johanna Treacy Peña. In the Census I found four members of this family. John (father), Patrick and Thomas living in the same place with Miguel Ahern (16 y/0). Mr. John figures as widow with 53 y/o and working as "labourer" (peón). Patrick figure as single and working as "boilermaker" (calderero) and Thomas working as "sailor" (marinero). Linda Koenig's insert: "I just reviewed the census list you sent me & I'd be willing to bet the Eduardo Murphy listed at line 11 & the Catalina Murphy listed at line 12 are the Edward/Edmund Murphy & the Kate Tracey/Treacy Murphy of whom I've just written...the parents of Nora Murphy Perkins & Margaret Murphy Leahy, Eamonn Leahy's mother...Linda Koenig"
Then, there is another record in the Census where figures Johanna Treacy. She is 13 y/o and was living in the house of Mr. Carlos Reynolds and his family. She figure as "servant" (mucama), catholic and motherless. This last detail it is coincident with the marital status of John in the above record, so Mrs Kate Treacy died between 1889 and 1895. Love to all your father and Jose.